Returning Patients to Sports & Active Lifestyles. Brian Forsythe, MD, an orthopedic surgeon and sports medicine specialist, recently joined Midwest Orthopaedics at Rush, according to a practice news release. Dr. Forsythe has a professional interest in minimally invasive sports medicine techniques for shoulder, elbow and knee care. He earned his medical degree at the University of Pennsylvania in Philadelphia and completed his residency at the Harvard Combined Orthopedic Surgical Residency Program. His additional training includes a shoulder and sports medicine fellowship at the University of Pittsburgh Medical Center. In the study, obese women who exercised while using the AvaCore Rapid Thermal Exchange (RTX palm cooling device) improved their exercise tolerance and cardiovascular fitness. The cooling devices cooled the palms of the hand and circulating blood, thus pulling heat off the body. Children are prone to sport-specific trauma to the growth plates. For example, dancers, skaters and cheerleaders are vulnerable to ankle damage, while baseball and football players tend to injure their shoulders and elbows. Runners suffer shin pain and knee problems, while gymnasts are prone to wrist damage from repetitive weight bearing. "The combination of repetitive use and skeletal immaturity puts these youngsters at high risk for injuries, some of them long-lasting, so it is really important that young children have whole-body conditioning and engage in a variety of athletic activities rather than one sport," Valasek says. For children aged 14 and under, delaying reconstructive surgery for anterior cruciate ligament (ACL) injuries may raise their risk of further injury, according to a new study by pediatric orthopaedic surgeons. If surgery occurs later than 12 weeks after the injury, the injury may even be irreparable. ACL injuries have increased among children and young adults in recent years, possibly because of increased participation in high-level sports such as football, skiing, lacrosse, hockey and soccer, all of which place a high demand on the knees, where the ACL is located. ACL injuries have increased 400% in teens and adolescents in the last ten years. They’re also on the rise among baby boomers. To make sure you don’t have to pay out-of-pocket to fix the injury, doctors are using a new tool to show surgery works. Of the roughly 200,000 ACL injuries a year, nearly 100,000 of those are fixed with surgery. The cost of surgery ranges from 20,000 to 50,000 dollars, followed by months of rehab. It typically takes six to twelve months after surgery to get back to normal activity. Adding movement to mental rehearsal can improve performance finds a study in BioMed Central's open access journal Behavioral and Brain Functions. For high jumpers the study shows that dynamic imagery improves the number of successful attempts and the technical performance of jumps. The technique of mental rehearsal is used to consolidate performance in many disciplines including music and sport. Motor imagery and physical practice use overlapping neural networks in the brain and the two together can improve performance as well as promoting recovery from injury. Researchers from the Centre de Recherche et d'Innovation sur le Sport found that adding simple movements to mental rehearsal could further improve performance by a third. Exercise doesn't only strengthen your heart and muscles - it also beefs up your brain. Dozens of studies now show that aerobic exercise can increase the size of critical brain structures and improve cognition in children and older adults. University of Illinois psychology professor Art Kramer, a nationally recognized expert on the role of physical fitness on cognition, discussed these brain-changing outcomes at a session of the 2013 meeting of the American Association for the Advancement of Science in Boston. Kramer is the director of the Beckman Institute for Advanced Science and Technology at the U. of I.
Osteoarthritis is known as the "wear and tear" form of arthritis. If you're overweight, you could be putting more strain on your joints and adding to this wear and tear. But losing weight could change that. A recent study showed that patients with knee osteoarthritis may be able to relieve pain and improve function by losing weight. &COPY; Brian Forsythe M.D. 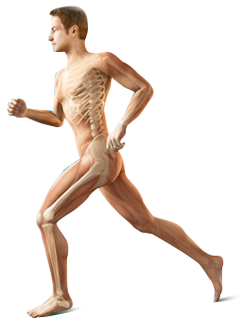 Board Certified Orthopedic Surgeon Sports Medicine Frankfort IL.